Sensuke Shishido (right) meets with Date City Board of Education members. They are holding a banner sent to Fukushima by Dwyer Middle School students in Huntington Beach. The tour will kick off with a special two-hour presentation and discussion open to the public on Sunday, April 27, from 4 to 6 p.m. at the New Gardena Hotel, 1641 W. Redondo Beach Blvd., Gardena. The lecture will be in Japanese with English translation. Shishido will share his first-hand experience in protecting the children of his school in the wake of the March 11, 2011 earthquake, tsunami and nuclear crisis, as well as ongoing efforts to help improve the educational environment. He has been involved in securing government recognition and funding for “traveling classrooms,” which will allow Fukushima children to have much-needed outdoor experiences in safe areas outside of Fukushima Prefecture. The advocates of this effort celebrated a milestone this week, winning $3 million in government funding. Shishido will then visit schools and universities in Southern California and Arizona, including Chapman University, Huntington Beach High School, Dwyer Middle School, and the Peak School in Flagstaff. Presently, Shishido is a representative of the Asian Education Friendship Association, which builds schools in Vietnam and Laos. In his spare time, he works tirelessly to raise awareness about children in Fukushima. Shishido is a popular speaker and educational commentator throughout Japan. Since 3/11, he has addressed dozens of groups in Japan, and has taken his message to France. Families for Safe Energy, a Huntington Beach-based nonprofit organization that supports communities and schools in learning about energy-related topics, is organizing Shishido’s tour. In Arizona, Families for Safe Energy is cooperating with the Sierra Club’s Grand Canyon Chapter. In March 2013, Families for Safe Energy supported Dwyer Middle School in Huntington Beach to organize events related to the second anniversary of the disaster in northwestern Japan. 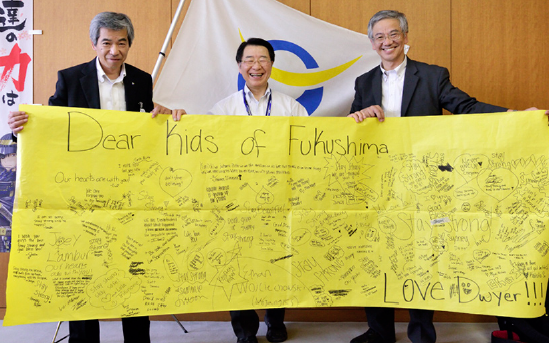 The students signed a large banner, which was delivered to Shishido in Fukushima, who, in turn, shared the banner with the Date City Board of Education in Fukushima, as well as with his former students at Tomino Elementary School in Fukushima. For more information, contact Beverly Findlay-Kaneko of Families for Safe Energy by email at [email protected] or visit www.facebook.com/FamiliesForSafeEnergy.